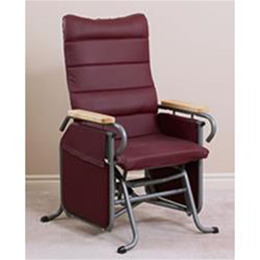 Designed for fall prevention, the Broda Auto Locking Glider begins to glide once the resident sits in the chair, and stops gliding once the resident begins to vacate the chair. It also features a caregiver lock to prevent unwanted gliding. The smooth gliding action of the chair produces a calming effect and can help reduce the need to wander. It also provides mild exercise.